EVOLVE! Campaigns - What's wrong with eggs? Chickens are domesticated descendants of the red junglefowl (Gallus gallus) that live in south-east Asia. A red junglefowl lays 12 to 20 eggs a year. Intensively bred domestic hens, through forced methods such as near-constant lighting in the sheds—which trick the hens' pituitary gland—lay nearly 300 eggs a year. A red junglefowl can live several years in the wild. A commercial egg-laying hen lives up to one year then goes for slaughter, worn out by egg-laying. And for every egg laying hen at a farm, an unprofitable rooster chick has been killed at the hatchery. Millions of day-old male chicks are killed every year because they are worthless to the egg industry. While their sisters go into servitude as egg layers, these tiny newborns, surplus to requirements, are either either gassed, suffocated or ground up alive. Many people insist that they only consume "humane" or "free range" eggs, however they forget that a lot of the eggs they consume are from ready-made baked goods, including cookies, pies, muffins, and even bread. Most of the eggs in those foods come from battery cage hens—one of the cruellest agricultural methods in existence. Furthermore "cage-free"and "free-range" hens endure the same bodily manipulations and mutilations, not to mention the total denial of all their natural feminine instincts and behaviours, and they all ultimately end up at the same slaughterhouses when their "production" declines. Peaceful Prairie says: Once people allow themselves to entertain the possibility of living egg-free, it's quite empowering. They suddenly realize that Yes! It can be done. 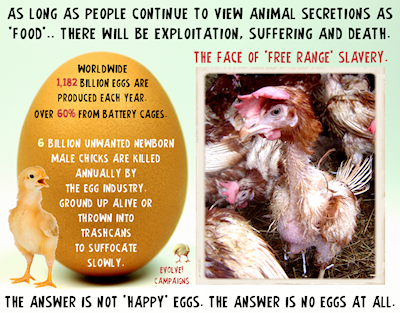 Millions of people before them have cut eggs and products made with eggs out of their lives and are doing just fine! 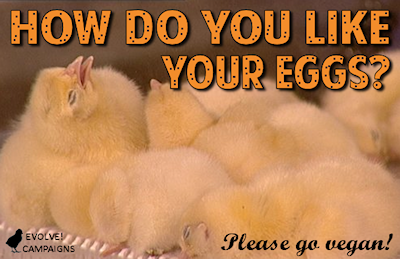 Organic, free range, barn or caged eggs, none have any commercial use for adult males. Millions are killed each year just in the UK alone. The Truth Behind Eggs - An illustrated account of the truth behind eggs from the point-of-view of a chick, maturing to a hen on a free range farm. By PeacefulAbolitionist on YouTube.